You will need to move your leaf on your pendulum stick up slightly. Moving your leaf on the pendulum stick approximately 1cm up, will make your clock run about 10 minutes faster. You will need to move your leaf on your pendulum stick down slightly. Moving your leaf on the pendulum stick aprroximatley 1cm down, will make your clock run about 10 minutes slower. The hour hand on your clock has been moved. Set off your clock on the hour and count how many cuckoo calls it does and then move your hour hand (Small hand) to the corresponding number. For example: If your clock is cuckooing 5 times and it is showing 7 O’clock, then you will need to move your hour hand to the 5 position. Your minute hand has become loose. Set off your clock by moving the minute hand and let it cuckoo/strike. Loosen off the small nut on the front of the hands and reposition your minute hand to the correct position. Re-tighten your nut using small pilers. Only tighten till it is firm, do not over tighten. Make sure that your clock is hanging correctly using a screw drilled into the wall at a 45 degree angle to the top. 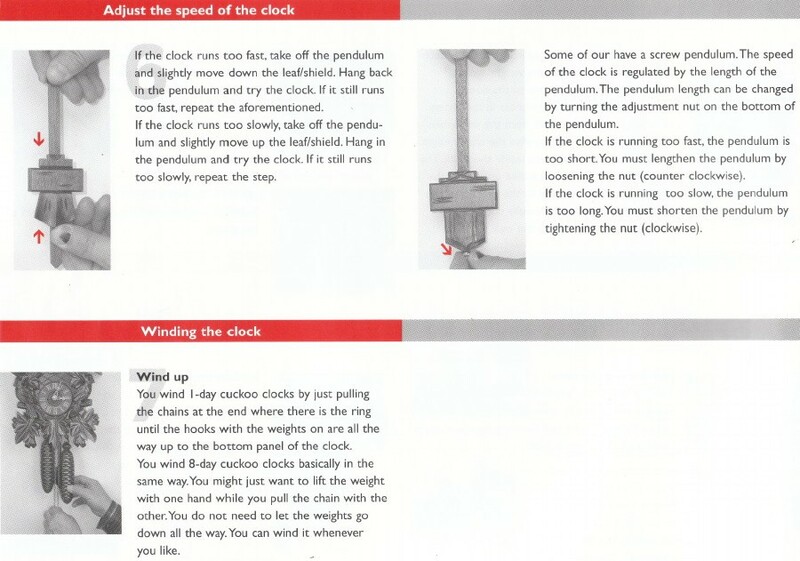 It is also important that your clock sits flat against the wall so that the pendulum can swing freely. Also listen to the beat of the tick to make sure it has an even “Tick Tock”. Put your ear up to the clock and listen to the tick of the clock. If it does not sound even , slant your clock slightly to either the left or to the right until you can hear an even “Tick Tock” . You will notice that moving the clock to the left and the right will change the sound of the “Tick Tock”. If the clock wants to run slanted to the left then you will need to bend the wire pendulum hanger (where your pendulum attaches to) to the left. If the clock runs slanted to the right then you will need to hang your pendulum hanger to the right. Only bend it a little bit at a time until you find that your clock is running correctly with an even “Tick Tock” in the straight position. You may have to repeat the procedure a few times until you have it running correctly. The On/Off lever is in the Off position. The weights have not been hung onto the hooks on the chains. The wire has not been removed from the chains. Not enough space between the gong spring and the hammer. Open the back door of the clock and push the gong coil slightly down so that there is a little more clearance between the hammer and the gong coil. Also check to make sure the gong coil is not laying too close to the back door. If it is, carefully pull it out a small amount so that it is no longer touching the back door. The difference between a 1-Day and a 8-Day clock is the length of time the clock will run before needing to be wound up. 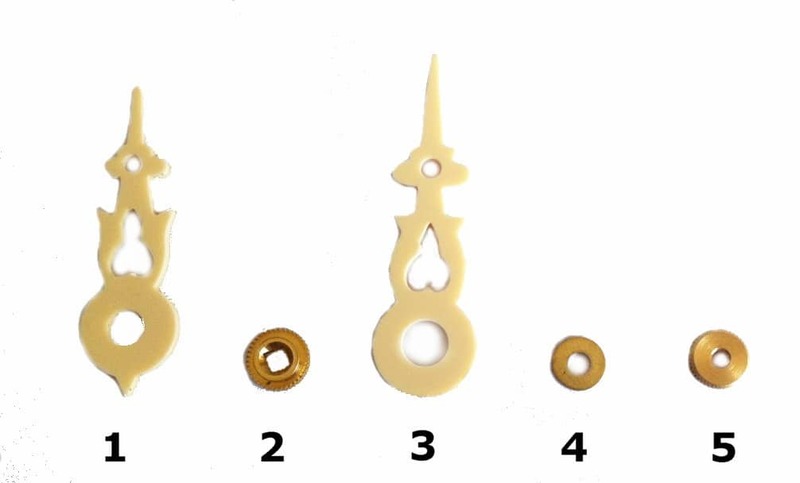 8-Day Cuckoo Clocks are fitted with a mechanical movement that requires winding every 8 days and 1-Day clocks are fitted with a mechanical movement that requires winding every day. Quartz clocks operate on batteries and do not require any winding. Linden wood is used to make cuckoo clocks as it is very good for carvings. The picture above, indicates the order in which the hands and hardware need to be put on, from left to right. Push the hour hand onto the shaft of the clock until it is tight. Put the minute hand on and the hand will fit nicely over the square washer. 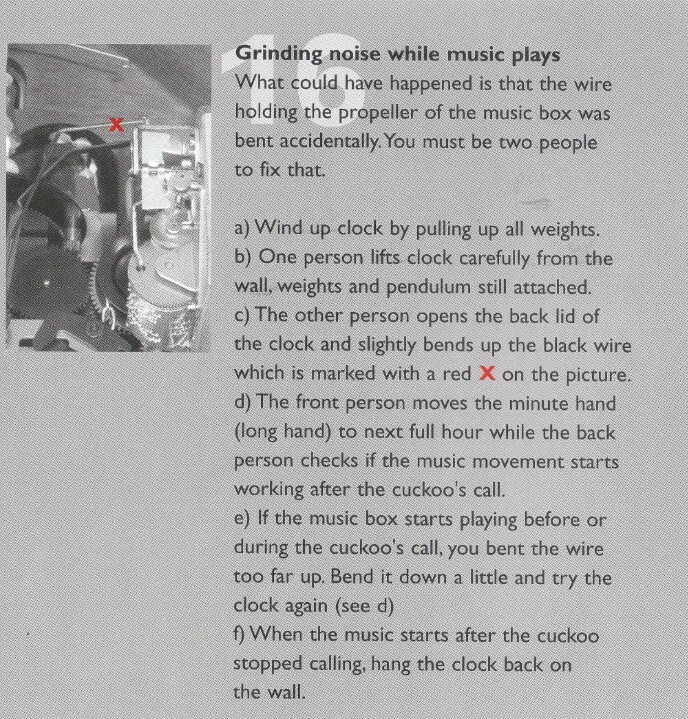 Put the washer on and then the nut and tighten.If the clock does not cuckoo at the correct half hour or hour position you will need to loosen off the minute hand and reposition it to the correct point. 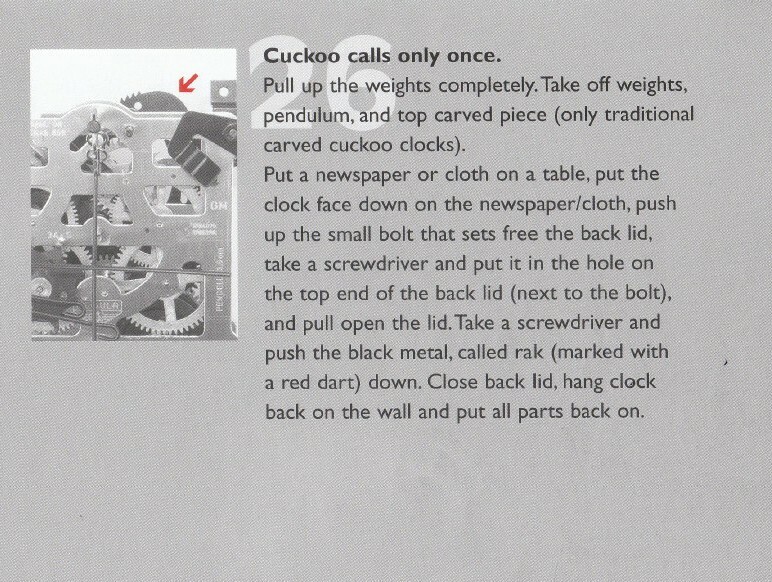 If the cuckoo is cuckooing the wrong amount of number all you have to do is move the hour hand to the correct number. For example if the clock is showing 10 O’Clock and it only cuckoo’s 5 times then you need to move the hour hand to the 5 position.